Discover Jungla Maya, where is the main entrance into the amazing Sac-Actun system, the world’s longest underground river, explored and recommended by National Snorkeler specialized cave divers. Snorkel sorrounded by awesome rock formations. Ride through the jungle on our all-terrain. Rappel down into a cenote (underground cave) and swim in a unique natural pool. 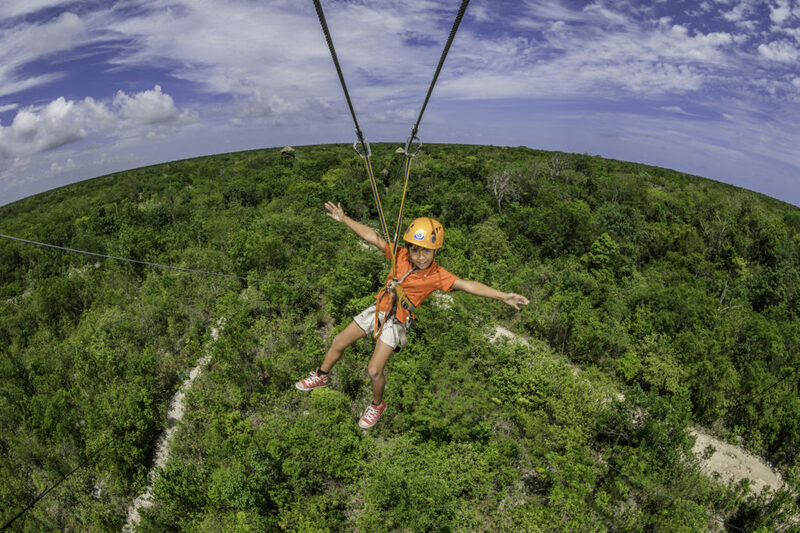 Enjoy nature flying over the jungle’s foliage on exciting zip-lines. Participate in a traditional Maya purification ceremony. Date Some dates might be unavailable depending on your hotel location. Click here to learn more. **Kids under 5 years old pay 25 usd *** ***The published price does not include: food, jungle Maya and transportation. Cool off in the clear waters of Nohoch Na Chlich, entrance to an underground river. · Maiximum weight – 264 lbs. *This expedition is not suitable for children under 6 years old. *People under the influence of alcohol or toxic substances won’t be allowed to participate. *Children from 6 to 12 years old pay kids price. From 13 years old pay adult price. -10% OFF purchasing 8-29 days in advance. -15% OFF purchasing at least 30-44 days in advance. -20% OFF purchasing more than 45 days in advance. *Prices are subject to changes without prior notice. Discover Jungla Maya where is the entrance to the amazing Sac-Actun system, the world’s longest underground river, explored and recommended by National Snorkeler specialized cave divers. Explore the impressive Tulum archaeological site. It is set on a cliff giving you stunning views of the Caribbean Sea. This beach has been declared one of the best in the world! What an unbelievable experience this was! Wonderful time, would recommend your company to anyone. I love what your company is doing for the Mayan community and how supportive your staff is to one another. Keep up the great work!! His dedication, knowledge and passion for the Mayan culture has touched me in a way that I'll never forget! ©2017 Alltournative®. All rights reserved.